On Sunday night, NBC broadcast a salute to 40 year salute to Saturday Night Live. Boy, how could that be? Forty years? But I'm only 29, and I remember the first episode. In my junior year of high school, my friends and I thought Saturday Night Live was the heights of comedic coolness. 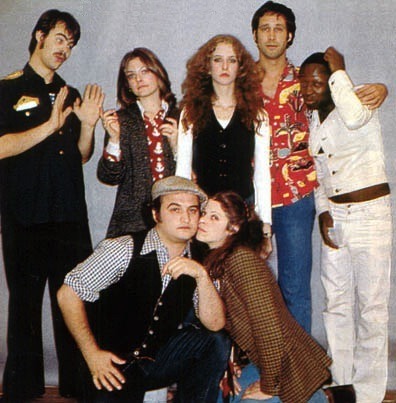 There was nothing on television like SNL at that time and each one of the original cast members would go on to do movies and other things - if they were lucky - but they'd always be remembered for the sketches and characters. One thing I really appreciated about the anniversary show was the effort to include as many cast members as possible and revisit the iconic bits. I'm gonna go out on a limb and say that everyone has a skit or character they love. Great characters and sketches were in abundance. Gilda Radner's Rose Ann Rosannadanna had to be the amateur impressionist's go-to lunch table act. Everyone gave it a whirl. A close second was Mr. Bill. The Blues Brothers, Waynes's World, Buckwheat, the Church Lady and short films provided something for everybody. You didn't have to be be Jewish to sing the "Hanukkah Song" with Adam Sandler; you didn't have to be in Blue Oyster Cult to howl when Christopher Walken "needed more cow bell." Subsequent years had highs and lows - some stellar castings, some not so much. The realization of how many of the past cast members are no longer with us is sobering, however. Seeing Dan Akyrod and Jim Belushi as the Blues Brothers made John Belushi's absence the focal point of the song. At this point, Jim has probably done that role more than John ever had a chance to do it. Some one had to fill those shoes, I suppose. So many of the dearly departed cast can never be replaced. Kristen Wiig will always be Kristen Wiig, but never a Gilda Radner. Both great; each unique. And when they're gone we won't soon see the likes of them again. Chris Farley, Phil Hartman, Jan Hook; all gone too soon. The body of work remains and has become part of our culture. Familiar, like old friends (at the risk of sounding sappy...oops, too late). Back in the late 80s, I was in a hotel lobby in Pittsburg waiting for someone. Looking to my left, I was struck by the beauty of a lady standing next to me; she appeared to be waiting for someone, too. Girls don't usually go ga-ga over other women; they lust over their shoes and jewelry silently, but that's about it. This woman was gorgeous and had that "you-ain't-from-around-here" look. Absolutely perfect blond hair added to her doll-like appearance...and that hair was 80s BIG. I thought that a Barbie doll had just transformed itself into its human counterpart. There was a familiarity about her. Did I know this person? Then it hit me. I turned and asked, "Are you Morgan Fairchild?" Yes, it was! Keep in mind, this was when Morgan Fairchild ruled the airwaves in such hits as Dallas and North and South. We chatted for a few minutes; of course I asked what she was doing in my neck of the woods and she explained that she was waiting for Gary Puckett (they were dating at the time). She told me about his current tour and mid-sentence, she pointed at the double doors and said, "There he is!" He smiled, said hello like he knew me and off they went. She turned and waved at me and shouted, "thanks for keeping me company!" I live for a great story and couldn't wait to call my friends and tell them about my celebrity sighting; I had actually been yakking with Morgan Fairchild! I talked to Gary Puckett - the Gary Puckett! My enthusiasm for sharing this story sunk like a rock. Everyone thought I was making a joke due to the popularity of Jon Lovitz's "liar" skit - it always included a reference to "his girlfriend, Morgan Fairchild!" Convincing my friends that I was telling the truth took some time; Morgan Fairchild is forever linked with Jon Lovitz. SNL was a great program. I didn't discover it until recently, but I saw some of the clips and they are quite entertaining! We need more good comedy programs on television. Most are so uneven. Thanks for stopping by, EPT! I enjoyed your review of the SNL 40th anniversary show and I can't wait to show the post to my wife, Jennifer Aniston. Yeah, that's the ticket.... Jennifer Aniston! I was working at an NBC affiliate when SNL premiered in 1975. I continued to watch it through the early 90s and finally bailed when it became consistently unfunny. My favorite Gilda Radner character was Lisa Loopner opposite Bill Murray as Todd DiLaMuca. My favorite cast members were Bill Murray, Dan Aykroyd, Mike Myers, Dana Carvey, Chris Farley, Phil Hartman, Jon Lovitz and Kevin Nealon. If I am to be honest about it, I think Chevy Chase and John Belushi were slightly overrated and I think Eddie Murphy and Adam Sandler were overrated even more. Oooooo, baby, me and Cherdo was out all night. I knocked on her door, and when she asked, Who is it? I said, Land shark. She said she couldn't open the door, so I knocked again. This time I got smart and said, Dolphin. She let me in, and then we talked about violins on TV. After that we ran around her neighborhood, waking the neighbors with our laughter. Finally, as the sun rose, we made a list of our favorite male babes. #1 was Baby Del Knight! Cherdo is dealing with SNOW DAY at mi casa and all the gentlemen are home and the ones that flew the nest are worrying me in this weather. Juggernaut is in New England - yikes, again! Fortunately, he called tonight, so I started breathing again. If I didn't have Janie to frolic with, I don't know what I would have done. Have a good evening, S & J! Stay out of trouble unless you stop by and pick me up. It's only fair. What a cool Morgan Fairchild story! She sounds amazing. She presented an award to Nora Roberts at the Romance Writers of America conference back in the 90s, when I was a member. My friends said she pretty much was surrounded by her "entourage" most of the time and went straight from the room to the stage and back again. If something like that happened today, you'd be tempted to ask to snap a photo with her to post on social media...and that would spoil the moment. She liked you because you talked to her like she was just a fellow human being...the second you get all star struck, that creates a separation that is almost disappointing in a way. That's all they really want after the excitement over being famous wears off--just to talk to other people one on one occasionally. But I'm telling you, Stephanie, back in the day she was too beautiful to walk around Pittsburgh, ha ha. I watched the 40th anniversary special until Downton Abbey came on, but I recorded the rest of it (haven't watched it yet.) Your blog post is a great tribute to the show. I miss the cast that included Chris Farley, Mike Myers, Dana Carvey, and Phil Hartman--that was when the show was really at the top of its game. And love your story about meeting Morgan Fairchild! I missed Downtown Abbey! AHHH! I forgot about that. Love that show. Phil Hartman was just awesome - I forgot to mention him. I loved everything about him. Darn! I missed this and it's been the hot topic this morning on the talk radio shows I listen to. I used to watch SNL all the time in the early days. Haven't seen a show in years, but I'd enjoy a retrospective look at some of the highlights in the show's history. One of my favorite skits was the Christopher Walken take on a Stephen King story that I forget the name of the movie but the skit was called "Trivial Psychic". Hilarious! I can't believe SNL has been on for 40 years! You met Morgan Fairchild? How neat! That would be a story to tell. Forty years - it's crazy. I remember the early shows like they were on yesterday. Chrys, I think I'm getting old; like for real. Don't hate me, CHERDO, but I was never a SNL fan. To me, SECOND CITY (SCTV) blew SNL's doors in. Gimme Count Floyd over John Belushi's ineptitude with a Samurai sword any day. However, I DID like that Blue Oyster Cult skit with Christopher Walken. What made it even funnier to me is the fact that there isn't ANY cow bell on 'Don't Fear The Reaper'. I loved your V D post and just left a comment for ya there. Happy to see you're back to blogging again. (AKA, happy to have computer access and your blog bits to read again). Back to blogging? I never left, ha ha. Some are just so bad they don't register on the blog-o-meter. I can't hate you if I liked SNL and Second City - which I did. They were so different and both were great. And they both needed more cow bell. I wish I'd known that was on last night. I would have DVRed it. Maybe they'll show it again. I'll Google it. I was an early days SNL woman . . . errrr, I mean child . . . and eventually lost interest. Sometimes Favorite Young Man says something to me and I'll come back with "I'm Chevy Chase, and you're not" or "As Rose Ann Roseannadanna's father always said _____ (you fill in the blank). Then I have to explain what these crazy comments mean. I remember Morgan Fairchild's earliest days in Hollywood. She was on a nighttime soap that only lasted a few years. Can't think of the name. She was so beautiful. But the very first time I saw her, I think she played a server for one episode on a sit-com. Again, can't remember. I'm glad she was pleasant to you. I don't remember her on Dallas. Something that made me sad about SNL was seeing some of the original cast members together on a show a few years ago. Jane Curtain (sp?) was very bitter about the way the female cast members were treated by John Belushi. She said he didn't think women could be funny, and he did everything he could to sabotage their sketches. Look at me! I'm so great I even respond to my own comments. She starred on Flamingo Road. She was the first actress to play Jenna Wade on Dallas (later Priscilla Presley had the part). I can't find the sit-com she was in only once, but I found out she was on Search For Tomorrow in her very early days. I'm sure I would have seen that. Morgan is from Dallas and her name is Patsy Ann something-or-other. Janie, would you please remove your comment along with your reply on the grounds that this is simply too much information? Thank you! Jane Curtin: I correct my spelling, too. Shut up, Baby Del Knight. You two kids go to your separate corners. Just because Mommy has been busy all day doesn't mean you can go at each other with wild abandon. There will be extra chores for you both. Shady: Leave Janie alone. She knows stuff. Janie: I heard Jane Curtain talk about women in comedy, too - it must have been the same show. I've heard several of the ladies complain about air time. But Jane Curtain and Nora Dunn both had a permanent scowl, it seemed. Then you have Kristen Wiig and Kate McKinnon, who seem to get plenty of air time. I guess the times are a-changin'. Good night, Shady and Janie! The times made their major change when Tina Fey and Amy Poehler took over Weekend Update. You're right: I know stuff. I didn't realize that The Blues Brothers and Wayne's World began on SNL. We used to have a Saturday night variety show called Hey Hey It's Saturday. To try and explain the show now would be somewhat of a nightmare, but it was VERY popular at the time. I'm not sure what the following is elsewhere, but here - SNL is iconic. I know what you mean about the difficulty in explaining a show to someone who has never seen it. I was trying to explain The IT Crowd (a British show) to a friend. All I got was blank face; she totally didn't get the appeal. And yes! The Blues Brothers and Wayne's World started on SNL. Wayne's World! Party on! Excellent! I'm an idiot - I missed Downton Abbey. Your husband needs to call me 15 minutes before it airs...he is much more "on the ball" than I am. Now I have to figure out how to see that episode. Edith has me worried. Hey, Stephen like SCTV more, too. I liked them both. We still mock Dieter; I tried to explain it to my son and he gave me the blank look. Go to pbs.org. They usually have the most recent episode of DA online.